The gas produced by the battery during the jump-start operation is highly explosive. If these instructions are not followed exactly, serious personal injury and damage to the vehicle may occur! If you are not sure how to follow this procedure, seek qualified assistance. Automobile batteries contain sulfuric acid. This is poisonous and highly corrosive. When jump starting, wear protective glasses and be careful not to get acid on yourself, your clothing or on the car. o If you should accidentally get acid on your skin or in your eyes, immediately remove any contaminated clothing and flush the area with clear water for at least 15 minutes. Then promptly obtain medical attention. If you must be transported to an emergency facility, continue to apply water to the affected area with a sponge or cloth. o The gas produced by the battery during the jump-start operation is highly explosive. Do not smoke or allow a spark or open flame in the vicinity. o The battery being used to provide the jump start must be 12-volt. If you cannot determine that it is a 12-volt battery, do not attempt to use it for the jump start. o To jump start a car with a discharged battery, follow this procedure exactly: 1. If the booster battery is installed in another vehicle, be sure the two vehicles are not touching. 2. Turn off all unnecessary lights and accessories in both vehicles. 3. Attach the clamps of the jumper cable in the exact location shown on the previous page. First, attach one clamp of the jumper cable to the positive (+) post or cable of the discharged battery. Then attach the other end of the same cable to the positive (+) post or cable of the booster battery. Next, using the other cable, attach one clamp to the negative (-) post or cable of the booster battery. Then attach the other end of that cable to a solid metal part of the engine away from the battery. Do not connect the cable to any moving part. 4. Start the engine in the car with the booster battery and let it run for a few minutes. This will help to assure that the booster battery is fully charged. During the jumping operation, run the engine in this vehicle at about 2000 rpm. 5. Start the engine in the car with the discharged battery using the normal starting procedure. After the engine starts, leave the jumper cables connected and let the engine run at fast idle or about 2000 rpm for several minutes. 6. Carefully remove the jumper cables in the reverse order of attachment. If you do not know why your battery became discharged (because the lights were left on, etc. 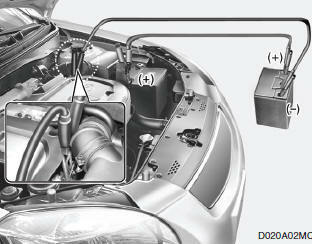 ), have the charging system checked by your Hyundai dealer.